The Enterprise must decide on its response when a Romulan ship sends an armed probe into Federation territory. The Romulans, using their cloaking capabilities, force the Enterprise into neutral territory to stop the threat. "Balance of Terror", written by Paul Schneider and directed by Vincent McEveety, is the fourteenth episode of the first-season. The episode first aired on December 15, 1966. It was repeated on August 3, 1967. The episode is a science-fiction version of a submarine film The Enemy Below, casting the Enterprise as the American destroyer and the Romulan vessel as the German submarine. This episode introduces the Romulans. Additionally, Mark Lenard, playing the Romulan commander, makes his first Star Trek appearance. Lenard later played Spock's Vulcan father, Sarek, in several episodes and movies, and appears as the Klingon commander in Star Trek: The Motion Picture. These roles made Lenard the first actor to play characters of three prominent Star Trek races. It took me years to do it, but I finally saw The Enemy Below a few weeks back. It is crackling good at maintaining dramatic tension with some pretty resistant elements, namely, submarine and ship shots that don't necessarily do a lot of dynamic motion. BoT is interesting the way it both reinforces Spock's alien-ness and addresses racism rather directly. I believe this was the first budget-saving "bottle show" in that they did no planet-hell-set shooting and only used a small, spare set for the Romulan vessel. Everything else, like the chapel, was a nominal redress of something already built. It also introduced the concept of cloaked starships, an obvious stand-in for the detection problems of ASW, but something that would unintentionally become a major feature of the Star Trek universe. It's fascinating that despite the anti-racism message in the narrative, the cloaking device also stands in as a suggestion of untrustworthiness as a Romulan trait (and indeed, despite the obvious strategic advantages, the Federation "good guys" would very rarely ever use one, explained away as a technological incompatibility but as in BoT also a signifier of the good intentions of Starfleet). I suppose you would have to say this may be the introduction of the concept of seeded/related humanoid species, to be explore much more fully in later Trek series. This episode, since I watched it (again, maybe? Can't recall) a couple years ago, has stood out as one of my favorites from the Original Series. In part because I really appreciated the characterization of the Romulan captain and the "duel" so to speak between the Enterprise and the Romulan ship. Key point - when a show opens up with a wedding of nondescript crew members, one of them WILL DIE. Just a fact, Jim. It was worth it for the proud expression on Scotty's face as he walked the bride down the aisle, and likewise, was interesting when the bride knelt in a silent prayer before standing up for the ceremony. It immediately made me wonder if in the religious-less future of Star Trek if something survived, indicative of personal preference rather than officially recognized. If I had been writing the episode, I completely would have gone for the wonderful, kill the bride, then finish the episode by opening up on her bridal bouquet in her hands in a coffin. I can't fathom that anyone back then would have considered killing a woman in combat, though. As dhartung noted, there was a heavy reliance on submarine hunting in this episode, even when it made no sense concerning Spock's accidental turning on of a noisy sensor. Unlike the importance of "running silent" there's nothing to convey the sound to the Romulan ship, but...it gets a pass for the drama it creates. The duel between the captains was so entertaining as each recognized at times the cleverness and skill of the other, which accumulated with Kirk taking the aforementioned sound accident which could have jeopardized the Enterprise and turning it into the check mate move of the battle. McCoy played the role of the ship's conscience well, even if briefly, Uhura even got to take the comm, which I doubt happened much more than once or twice again in the entire show. The issue of racism that was raised was definitely not necessary, but added a nice subtle message to the episode. 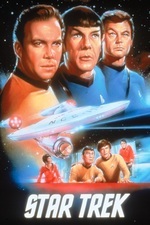 Arguably, I would also add that also reflected Communist hysteria in the Untied States at the time, especially after Stiles complains to the Captain, essentially drawing upon no real logical rationalization, that there could be Romulan spies aboard the Enterprise and shortly thereafter, we get a first glimpse of the Romulans and their shared appearance with Vulcans, i.e., Spock. That scene was wonderful as the entire bridge kind of as one unified group slowly turned and looked uncomfortably at Spock. The episode did introduce the Romulans and as worthy and dangerous opponents to the Enterprise. In a short span, we were informed that there were "good" Romulans, those who didn't glorify violence or think irrationally and there were those who were political creatures. Notably, the Romulan Bird-of-Prey, reflected a skewed version of the Enterprise, if that ship's nacelles (the long things) faced forward instead of away from the main disc/saucer section. In a way, symbolizing the Romulan similarity to humans, or even the Enterprise, with its own Kirk, but twisted. As a note, this episode pretty much featured all the beloved crew members with the exception of Chekov, who won't even appear until later in the series. I think it might also have been the last appearance of Yeoman Rand, who stood around looking kind of angry. I swear I'm leaving too much out, but definitely, one of my favorite Trek episodes. I love this episode and I prefer the 'bottle episodes' because they rely upon characterization and plot, instead of mindless fighting of BEMs. Mark Leonard and Leonard Nimoy do look nice together. The wedding is just shmaltz, and I hate that fake sentimentality. As the kind of person who has an entire Banker's Box somewhere filled with every single product for Star Fleet Battles, this is without a doubt my favorite episode of Star Trek. I love the chess-match between the captains, even if it is a pastiche of The Enemy Below and Run Silent, Run Deep. My favorite scene in the episode though is in fact the outro. Kirk has out-dueled the Romulan, been second-guessed by some of his crew, and had to operate without orders against an unseen enemy. Shatner gets a lot of crap for his acting, or over-acting as the case may be, but I think he's excellent in this episode, especially this scene. After Lt. Martine leaves, Kirk casts his eyes towards the religious icon for just a moment and a hint of doubt crosses his face. We see him leave the chapel and stride down the passageway, shipboard life continuing around him. As the music builds you see him process the incident and resume the mien of command, because the Enterprise must sail on and there's no time for captains to fret about the past.